Plaintiffs' attorney Arthur Lloyd shows jurors a government inspection report that he said proves The Forum at Desert Harbor knew their patients were at risk for developing bedsores. Click here to see video from the trial. Mesa — Nursing home operator Five Star Quality Care Inc. was walloped with a $16.7 million punitive damages verdict on Thursday in Arizona state court after already being nailed with a $2.5 million compensatory verdict for allowing an 86-year-old woman to develop an infected bedsore, bringing the total damages awarded to her family to $19.2 million. The jury agreed with attorneys for Doris Cote’s family that medical staff at The Forum at Desert Harbor, a skilled nursing facility, consciously disregarded procedures meant to keep patients from developing bedsores and intentionally falsified medical records to cover up other signs of abuse like severe weight loss. “All the policies and procedures that were implemented in The Forum came from Massachusetts,” Lloyd said, according to a Courtroom View Network webcast of the trial. Lloyd explained to the jurors that Five Star’s valuation on the New York Stock Exchange is over $200 million and that the company brings in annual revenues of over one billion dollars. He asked the jury to award between $18 and $20 million. Five Star's highest pre-trial settlement offer was $500,000 according Lloyd's co-counsel Micheal Wright of Udall Shumway PLC. Cote’s family sued Five Star in 2012 for wrongful death and elder abuse, claiming that while she recovered from an infected shoulder at The Forum, Cote was overmedicated with painkillers, allowed to fall multiple times, malnourished and eventually developed a bedsore that became infected with Methicillin-resistant Staphylococcus aureus, known as MRSA. She died of pneumonia six months after being transferred to another nursing home. However the jury said that while Five Star's conduct caused Cote's pain and suffering, it was not ultimately responsible for her death. The Forum tried to cover its tracks, Lloyd argued, by failing to accurately describe Cote’s weight loss in reports that all Medicare and Medicaid-certified nursing homes are required to file. He said Cote only weighed around 115 lbs. when she entered The Forum and lost nearly nine percent of her body weight due to malnutrition. Lloyd said staff at The Forum were aware of their misconduct, because federal inspectors told the nursing home’s administrators in 2011 that sufficient steps were not being taken to keep patients from developing bedsores, also known as pressure ulcers, which can occur when skin remains in contact with a surface like a bed for prolonged periods. “The facility failed to initiate care and provide services to prevent pressure ulcers and promote healing for six of seven sample residents,” Lloyd said, quoting from the report. The Forum agreed to make immediate changes which should have been completed before Cote’s admission in November 2011, but Lloyd claimed they only made these commitments in an attempt to stave off further scrutiny from the government. “What you’re here for today is to determine whether or not these promises that Five Star made were empty hollow statements designed just to get the government surveyors off their back,” Lloyd told the jury. Wright told CVN that in post-verdict discussions, members of the jury told him the egregiousness of Five Star’s conduct and the company’s net worth were the primary factors they took into consideration. Wright said the jurors reached their final punitive award amount by each picking a number and averaging them. 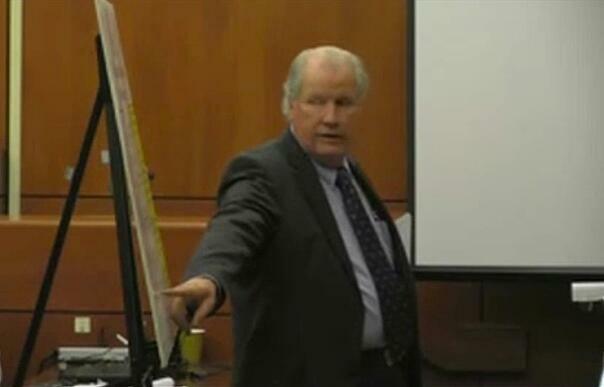 The jurors also said the 110 pictorial trial boards they saw played a role in their decision, according to Wright, who said his team used tactics advocated by Rodney Jew, a trial consultant who encourages the use of such visual aids. Wright said while the nursing home industry always takes notice of punitive verdicts like this, the jury’s decision would be more likely to impact the settlement of future cases than actual patient care. “They see it as a business expense and part of their risk management,” Wright said. He added that he expected Five Star to appeal the verdict, though he didn’t think there were any grounds for it to be reversed. “They’ll surely go through the motions,” he said. Representatives for Five Star did not respond to CVN’s requests for comment. The trial before Judge Mark Aceto was recorded and webcast gavel-to-gavel by CVN. The Cote family is represented by Arthur Lloyd of Lloyd & Robinson PLLC and by Micheal Wright of Udall Shumway PLC. The defendants are represented by Carol Romano and Kelli Williams of Gust Rosenfeld PLC. The case is The Estate of Doris L. Cote, et al. v. Five Star Quality Care Inc., et al., case number CV2012-094285, in Maricopa County Superior Court. Click here for a copy of the complaint.